This was quite an entertaining read. It began with a kidnapped man being thrown to his death from a bridge. The reader was then introduced to unemployed architect Nick Fellows who had accepted a job interview with mysterious company Aquarius Rising. From then onwards he was plunged into a fight to save the lives of his loved ones.... and the planet. Although quite a short novel, Aquarius Rising packed a whole lot of action into its pages. I thought it was competently written and highly enjoyable. The characters of Nick and Lisa were developed to a good standard and bounced off one another fantastically. The story was completely over-the-top in, a good way, and kept me entertained until the very end. Worth seeking out for a few hours' escapism. My thanks to author Christopher John Chater for providing a copy of this book. Out-of-work architect Nick Fellows never suspects a job interview will lead to a fight for his life. 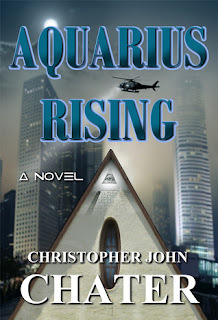 It begins when he receives an email he discovers is encoded with numerological numbers, sent to him from a mysterious company named Atlantis Revisited. Against his better judgment, he accepts an interview with them in a park in Manhattan. He's met by their strikingly beautiful recruiter, Lisa, who's only allowed to tell him that the company's primary focus is civilization building . . . and that their last architect was murdered. Immediately following the interview both of their lives are put in danger. But what could the company possibly be building, and who wants them dead because of it? The only thing Nick and Lisa know for sure is that they need to get to a place called Aquarius and Aquarius is rising.